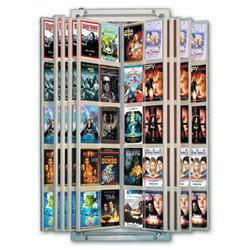 The wall mount DVD flip display saves retail floor space and can display up to 100 DVD in a small area. Each case displays DVD's from the front and back of each locked page, maximizing display space and keeping your product safe. This dvd display case can stand up to high traffic environments. This product can be purchased in black or almond finishes.